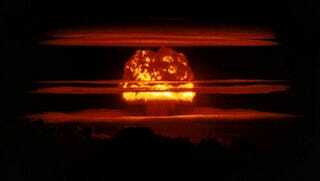 Why Do Clouds Suddenly Form Around Nuclear Explosions? Back when open-air tests of nuclear weapons were common, scientists noticed that clouds would suddenly burst into existence around the explosion. Soon afterwards, the clouds disappeared. What caused these clouds to flicker in and out of existence? Find out! Many of the classic images we see of nuclear explosions include rings, or layers, of clouds hovering over the mushroom of the explosion. They aren't clouds of smoke. They are atmospheric clouds that pop in, and out, of existence around a sufficiently large explosion. Below we see one hovering above an explosion of TNT. These clouds were generally seen around the nuclear explosions because so many of the open-air tests of nuclear tests were done in the tropics, and the clouds need a little humidity to form. They're called Wilson clouds, because they resemble the brief streams of condensed moisture in a Wilson cloud chamber. But the chamber shows us the presence of cosmic rays moving through the atmosphere. These clouds show us a kind of visual representation of the ongoing shock of the explosion. As the explosion pushes air outwards, it creates a shock wave - a wave of compressed air. In the wake of the compressed air, there is a kind of low-pressure zone. The air pressure there drops well below the ambient air pressure. This leads to large-scale adiabatic cooling. Pressure and temperature in gases are connected. Increase the pressure and the gas heats up - you'll notice this the next time you use a bicycle pump. Decrease the pressure, and the gas cools down. As the air around the explosion, after the shock wave, suddenly loses pressure, the air cools and the moisture in the air condenses into clouds. Clouds just pop into being around these huge explosions, sometimes in rings - as we see in the top picture here - and sometimes as a kind of echo of the mushroom cloud. As the pressure in the atmosphere equalizes, the clouds flicker out of existence again.